prices reflect FOB Vancouver Island, net distributed to dealer (Canada west coast). Our quarterly product is tailored to provide you with vital information about the North American solid wood, pulp, and paper industry at your fingertips in a timely manner. Don’t miss even one issue of this vital information! 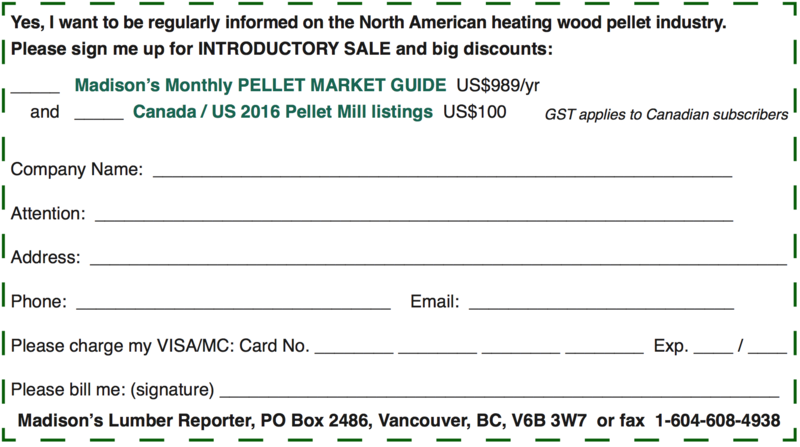 The latest data, to May 2018, on Canadian and US residential heating wood pellet exports is now out. Also, to April 2018 numbers for US and Canadian pellet production, sales, and prices as well as competing home heating fuel prices are now out. Don’t miss out on this vital and timely information regarding demand for sawmill residuals — kiln-dried wood chips and sawdust — and projections of demand for wood pellet production feedstock this year. No Other Directory Contains So Much Valuable Information! Let Madison’s help you find all the lumber you need! Madison’s 2017 Online Lumber Directory is far more than just a list of names and addresses. It is the most expertly researched and thoroughly cross-referenced directory available on the Canadian forest industry. Madison’sshows you who produces what, then puts you in touch with sales managers and key contacts in the Canadian forest products industry. It will prove its value to you every single day, because we designed it to make your job easier.